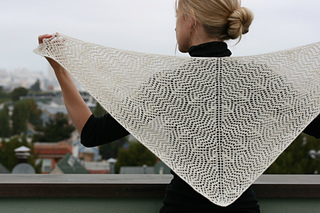 Keravnos (Greek for “thunderbolt”) is a triangular shawl that combines two simple lace patterns. 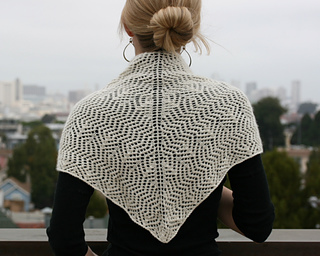 Zigzag Lace Trellis and Arrowhead Lace (both from Barbara Walker’s Treasury of Knitting Patterns) arch like lightening in two different directions and together create a modern and geometric piece. 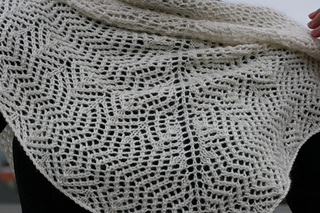 The shawl is knit from the top down, starting at the center of the top, straight edge. Keravnos takes only one skein (325 yards) of Tess’ Designer Yarns Kitten, a cashmere and silk blend that is heaven to wear. 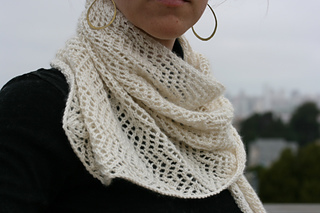 And because Keravnos is knit from the top down, it is easily enlarged with a second skein. 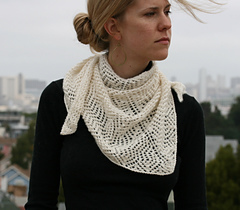 The pattern includes both charts and written directions for the lace. 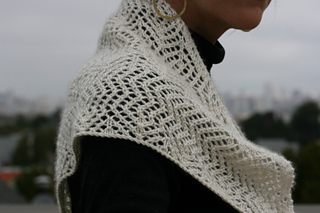 24 September 2015 - The last instructions in Row 11 of Arrowhead Lace should read, “rep from * to last 8 sts, k1, yo, ssk twice, k1, yo, k2.” This was corrected in version 3 of the pattern.